How will China's absence of creative education affect its future output? Where have the current generation of contemporary artists come from, and from where will the next surface? Sophie McKinnon, Director of Educational Projects for the Australia China Art Foundation (ACAF), discusses China's primary school generation; a generation without any arts education in their curriculum, yet still expected to take the lead as China brings creatives and innovators to compete internationally. 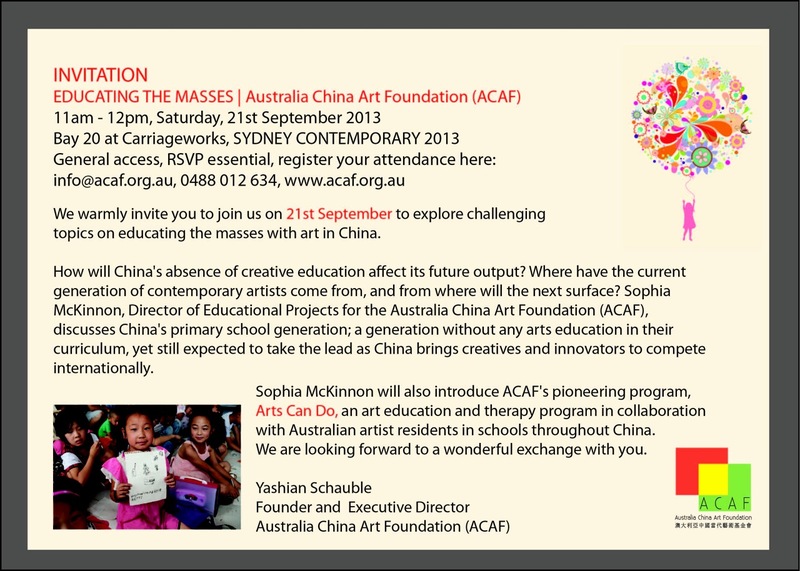 Sophie McKinnon will also introduce ACAF's pioneering program of art education and therapy, Arts Can Do, which sends ACAF's Australian artists-in-residence to work with disadvantaged children to help them reach their full potential by developing life skills and confidence through involvement in art.